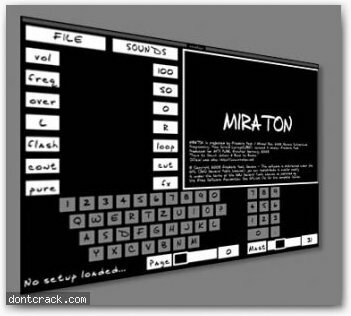 Miraton is a program to play and compose music live for Mac OS X. It is programmed to import sound files (.wav, .aiff, .mp3, .snd, .mov, any format supported by quicktime), to conceive music in a studio or in live improvisations. MIRATON 's simplified interface is easy to use for pure pleasure at home, as well as it is adapted for agitated electronics performances, giving the user the possibility to be free to move on stage, to have a more handy and instinctive approach of his electronic tool. It was originally designed for being used with a keyboard and a mouse connected to the laptop by a long cable usb (5 m) which is carried like a guitar or an accordion by shoulderstrap. However you can also use it as any application with a standard mouse and a standard keyboard. Basically you link a sound and some settings to each key of your keyboard. When a key is pressed the sound is played using the associated setting. You can also use the mouse to apply real time effects to the playing sound (it is achieved by clicking the rectangle area at the right of the screen). Two effects are associated to the mouse at the same time, one along the X axis and one along the Y axis. By default these effects are overdrive and pitch (they can be changed using the arrow keys of your keyboard).